In the serene setting of her home in New Delhi, Nafisa Ali is busy with her dogs, the children and her activist activities. Even so, she can barely contain her excitement over her forthcoming film -- Tanuja Chandra's Yeh Zindagi Ka Safar. Here she is Sister Namrata whose 20-year-old secret blows up creating chaos in her life after the arrival of budding pop-star Sarena (Amisha Patel) and rag-tag journalist Jai (Jimmy Shergill). Admitting she doesn't regard Hindi films highly, 44-year-old Nafisa says, "I could not say no when Mahesh Bhatt called me to say he had the right role for me to play in Tanuja's film." "I wanted to work with Tanuja as she makes strong women-oriented films. While her earlier films have more action, this one is more romantic. Yet it conveys a message, about the power of the girl child." Not willing to divulge details about her character as it would spoil the films, she says, "The film is a symbol of evil in our society and its manifestations. It is a commentary of sorts on men, the fundamentalism that prevails in our society and how women end up getting a rougher deal." Another reason for doing the film was her children, including two daughters. She wanted to show them that "meaningful Hindi cinema" did exist. Yeh Zindagi... is about a girl who fights all odds to probe the events that led to her adoption." Since her 1979 debut in Shyam Benegal's Junoon as a young English girl who Shashi Kapoor obsesses about, Nafisa has done a blink-and-you-miss "special appearance" with Vinod Khanna in Kshatriya. 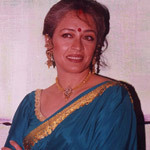 She also came in for a cameo, 20 years later, for Major Saab (1998) with megastar Amitabh Bachchan. "Acting with Amitabh was an ego trip. With him, I completed acting with the three heartthrobs of the 70s. I told Amitabh that for the first time after 20 years, I could look into a man's eye and show emotion. All he said was, 'Thank you.'" Nafisa is content with what life has to offer, and the odd Hindi film gives her a "kick to be around". "I turned down Raj Kapoor's film Heena when I was 16. He never made the film. His sons made it after he passed away. But, I'm still getting offers, and I'm 44." "I'm particular about playing an Indian. It's easy getting typecast in Bollywood. With my pale skin and light eyes, I received offers to play an English woman often. But I could also be Kashmiri or someone from another state... not all Indians are dark skinned." There is more to Nafisa than just acting. She gave up acting "without regrets" after Junoon at the age of 23 to marry the now retired Colonel Ravinder Singh Sodhi, an ace polo player popularly known as Pickles and winner of India's highest sports honour -- The Arjuna Award. Nafisa was shooting for Junoon in the pink city of Jaipur when she met her husband. "He was the only bachelor in a cavalry battalion used for some shots in Junoon. There was some match-making going on." Before her foray into the world of Hindi cinema, Nafisa was the national swimming champion from 1972-1974. She even bagged the Miss India in 1976 at the age of 19. Nafisa, who was also a Calcutta Gymkhana jockey in 1979, lights up as she talks about her work with the non-governmental organisations -- Action India and The Naz Foundation. At present, she is "trying to get some land to open her own AIDS care shelter. I want people to know there is a place to go to if they have AIDS. You know which hospital to go to for a heart or spinal problems. But no one will admit AIDS patients in India." Mention her work in Gujarat's Kutch district that was ravaged by an earthquake in January, and she says: "Action India helped build split-bamboo shelters there." "The idea came to me while taking a dip in the Ganges during the Kumbh Mela. Amidst the priest's chanting... I dipped, and it struck me... bamboo could be used to build homes for the displaced."